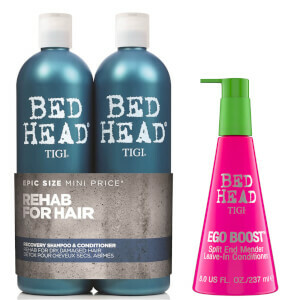 Restore softness and shine to damaged hair with the TIGI Bed Head Urban Antidotes Recovery Moisture Shampoo and Conditioner, a haircare duo that drenches dry locks in moisture to strengthen strands, protect against damage and replenish lost radiance. Bring damaged locks back to life with a gently cleansing formula for dry hair. 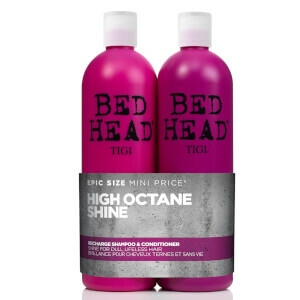 The shampoo expertly lifts away dirt, excess oil and product build-up whilst replenishing vital hydration to restore the natural moisture levels that can be unbalanced due to colouring and heat styling. The formula creates a protective barrier over each hair strand, helping to prevent any future damage and leaving locks soft, shiny and full of health. 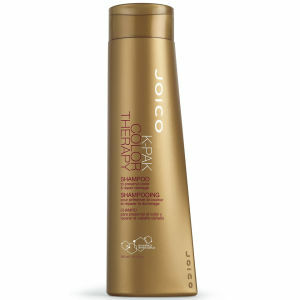 Envelop dry hair in a veil of moisture with a deeply nourishing formula to help restore damaged locks. The colour-safe formula delivers intense hydration to every strand, smoothing the hair cuticle to calm frizz and flyaways. Locks are left soft, swishy and oh-so-shiny. 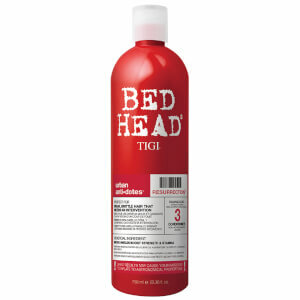 Shampoo: Work into lather on wet hair. Rinse well. Shampoo: Water (Aqua/Eau), Sodium Laureth Sulfate, Cocamidopropyl Betaine, Glycol Distearate, Fragrance (Parfum), Sodium Chloride, Guar Hydroxypropyltrimonium Chloride, Dimethiconol, Glycerin, Carbomer, Citric Acid, TEA-Dodecylbenzenesulfonate, PPG-9, Laureth-23, Tetrasodium EDTA, DMDM Hydantoin, Sodium Benzoate, PEG-45M, Phenoxyethanol, Magnesium Nitrate, Magnesium Chloride, Silica, Methylchloroisothiazolinone, Methylisothiazolinone, Benzyl Benzoate, Geraniol, Limonene, Linalool, Mica (CI 77019), Titanium Dioxide (CI 77891), Blue 1 (CI 42090), Yellow 5 (CI 19140). Conditioner: Water (Aqua/Eau), Cetearyl Alcohol, Dimethicone, Stearamidopropyl Dimethylamine, Fragrance (Parfum), Behentrimonium Chloride, Lactic Acid, Dipropylene Glycol, Amodimethicone, Potassium Chloride, Disodium EDTA, DMDM Hydantoin, Cetrimonium Chloride, PEG-7 Propylheptyl Ether, Phenoxyethanol, Magnesium Nitrate, Methylchloroisothiazolinone, Magnesium Chloride, Methylisothiazolinone, Benzyl Benzoate, Geraniol, Limonene, Linalool, Blue 1 (CI 42090), Yellow 6 (CI 15985).